To Celebrate a Snow Day! We had some very fun entries for our Snowman Photo Contest last week. Each one brought smiles to share throughout the office. Congratulations to our two winners! We are sending them $50 for their Cool Creations. Jody K submitted this sneaky snowman. Melissa E submitted the Mouse themed snowman. Thank you for joining us in some Fun in Snow. Image Credit: Melissa E. and Jody K.
Began with a stop at the Co-Op Feed store in Everett. They made quick work of loading about 700 pounds of feed for Rick’s animals. Since it is not far from my house I said that I would be happy to pick it up and deliver it for him. The neighborhood is filled with some intense hills. The truck handled amazing on the way in, however for the final hill I turned on the 4 wheel drive. I heard a pop of sorts as the truck lost its traction and began to slide rapidly back down the hill. I frantically shifted from 1st gear to reverse while trying to steer the slide and with a swish the drivers side went into the ditch. The track hoe was huge! Just what my beast of at truck, a 4x4 Crew Cab Dually Diesel, was going to need. He pulled me out of the ditch and anchored me as I backed down to safety. We loaded the feed into the “Wonder Buggy” to make the trip to the barn. Since I was having a terrible time with traction it was time pull out the chains. The Wonder Buggy returned and after we chained up the front and the outside duals I headed onward and upward. There was several inches of snow over an icy surface from the past storm. As soon as you crush the new snow, the texture acts like water on top of ice. A long straight climb came to a halt for my Jolly Green Giant. It was important to get off the hill, so I backed up to get traction, rolling forward slowly, rocking the rig forward and back to get some momentum, accelerating quickly, trying to steer to the side, different gears, and 4x4 settings. Nope still stuck. Pretty soon there are trucks trying to come down the hill, and trucks behind me trying to go up, and me a stuck in the muck, in the middle. Included the neighbors digging into the gravel road and breaking off small branches and spreading sand to provide traction for my tires. Bouncing on the tailgate while driving. The rescue truck they brought down...got its slide on, so they could not tow me up. In order to gain more traction they let some air out of the tires of that rig. I was not comfortable doing that with my dual wheels, as squishy Duallys that touch each other can cause a blowout. We discovered that my 4 wheel drive is not working and seemed to contribute to the traction control issues. The truck was in my opinion over reactive, however when we put it back into 2 wheel drive it settled down. The joy and relief that I felt as I followed it up the hill, was huge. These amazing neighbors treated me like one of their own. The energy that they put in to each idea was astounding. Thank you for getting me and my Jolly Green Giant back on the road and home to my family this evening. A tow strap and chain, 2 pairs of tire chains, a bungie cord, 100 pounds of sand, 350 pounds of rocks between the wheel wells, rocks to use as wheel chocks, plywood for a smooth surface, shovel, assorted tools, gloves, and a flashlight hat…lots of ideas! We like to compare the depth of the snow to decide if it is safe to travel. But many times it is the texture of the snow, compact snow and ice, water, slush on each surface that makes or breaks your rigs ability to connect with the road. Ad into that equation the specific hills, and angles of the roadway. Followed by factoring in the shade in a given area and the temperature at the time you are travelling. Your traction may also be directly affected by the way the snow began. Was the road covered in rain that froze first? Did the snow fall on top of a sheet of ice, or does the snow actually connect to the grooves of the road. Be Prepared, Be Safe, Stay Warm, and Thank You for the Help! 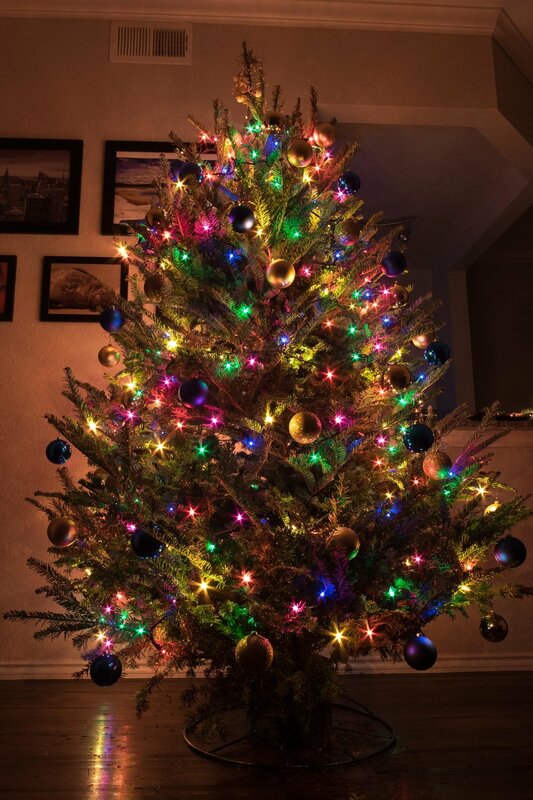 Your Christmas Tree has won $100 in our Christmas Tree Photo Contest! We enjoyed the delightful display. We are very pleased to announce that Amber has selected the Women and Children’s Shelter to receive the $100 Donation. These photos won $25.00 and the charity of their choice was also awarded $25.00! We are collecting donations for Beck’s Place in Monroe. At Beck’s Place they are committed to helping people and pets move forward in life. Keeping families together is important to Beck's Place and pets are part of the family. The signature program that they offer is a fostering service for those who must leave their pets for medical care, treatment, or other safety reasons. Melanie , founder of Beck's Place, mentioned that there are many seniors who will refuse care, so they do not need to leave or lose their pets. Knowing that when they return, their pet will be waiting to rejoin the family is important to many of these owners and allows them to make the choices needed to improve their lives. In addition to the fostering service, they meet needs related to food, supplies, cleaning, hygiene items, sleeping and outdoor supplies, and even clothing for both people and pets. We will be accepting donations through the end of the year at 3625 Colby Avenue, Everett, WA 98201. During Business Hours. We are accepting donations for Beck's Place to be shared with those in our local community who are struggling. Your Photo of your Christmas Tree could Win a prize of $100 in our contest, and you can choose one of these deserving Charities for Rick to donate $100 to. They say that taking pictures is making memories…Share your photo with Rick and you just might win a prize! Grab your camera and show us the picture you took of your Christmas Tree. We will display the Winning Photo on the Blog on Rick’s Website. Entries are due December 26th 2018 at Noon. After you submit your entry form, we will contact you with instructions for you email a photo of the Christmas Tree to complete your entry. Click here to enter. Fun Santa Photo Event with the Jingle Horse! Santa has invited Jingles to join him during his visit this year. 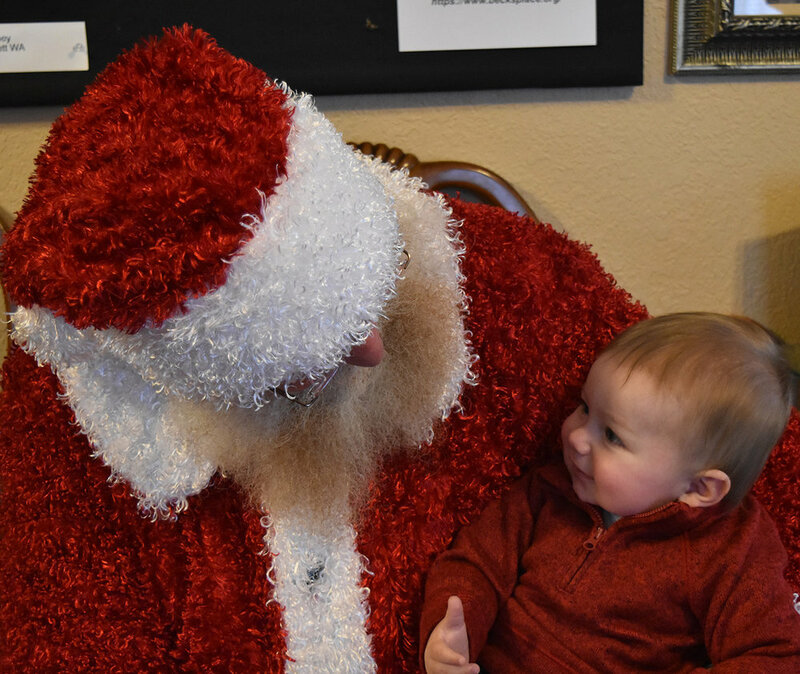 Kids and grown ups alike enjoyed their visit with Santa and Jingles on December 9th 2018. Jingles decided that he liked to be in the tent for much of the photo shoot, as the rain was a bit distracting. Hay Jingles? No Thanks, I had some already! We saw the horse and had to come check it out. If you have not gotten your photos yet.. Please call the office at 425-259-4972. We have some great photos of a a little guy in his cute red vest and another little guy in frog boots. We need to verify contact information to send the photos. 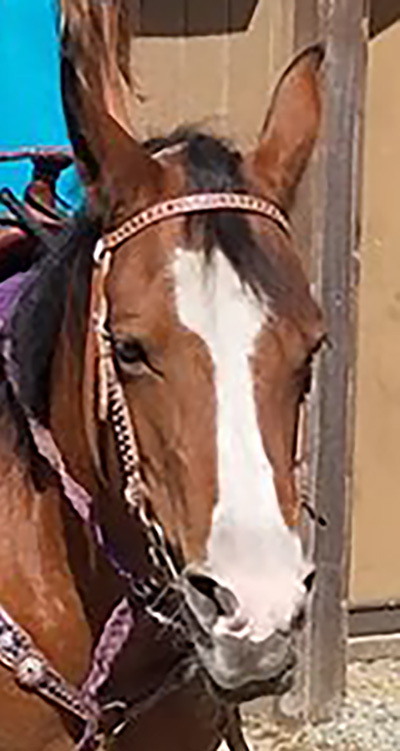 A special thank you to all who have donated to Beck’s Place, you helped to make someones day so much better. I took a carload to Beck’s Place including 10 sleeping bags, pet food, coats, boots and cash. We are accepting donations for Beck’s Place in Monroe. until December 28th 2018. Beck’s Place is committed to helping people and pets in our local community who are really struggling to move forward in life. Free Santa Photos with the Jingle Horse! Santa has invited a special friend to join him during his visit this year. 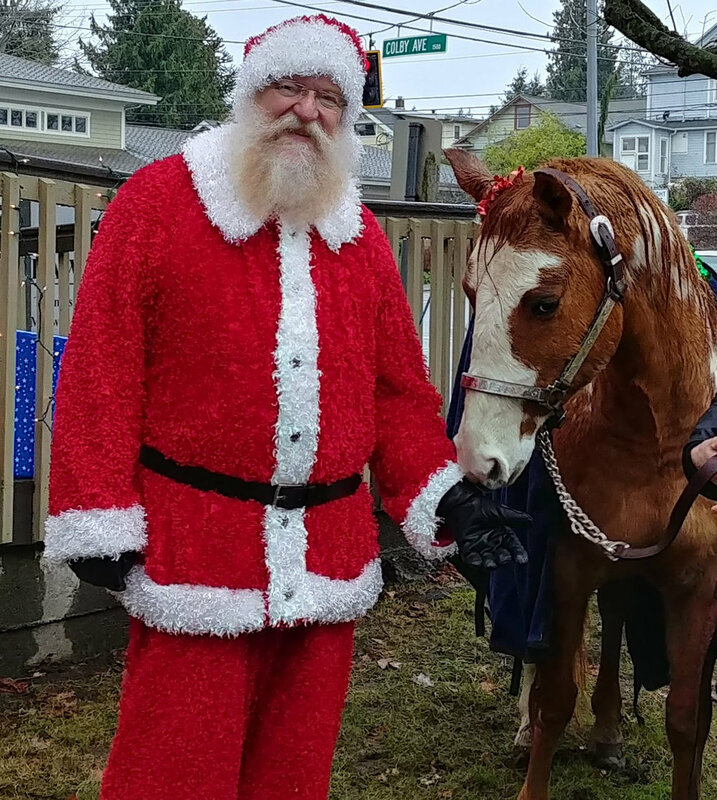 The Jingle horse will be catching a special delivery ride into the Law office of Rick Merrill on Sunday, December 9th 2018 for Free Photos with Santa from 1-3 pm at 3625 Colby Ave. Everett, WA 98201. Kids and grown ups alike are invited to come see Santa for this special visit to our “Neighborhood”. Parents are encouraged to join in the fun to help children feel confident and calm for their visit with Santa and Jingles. 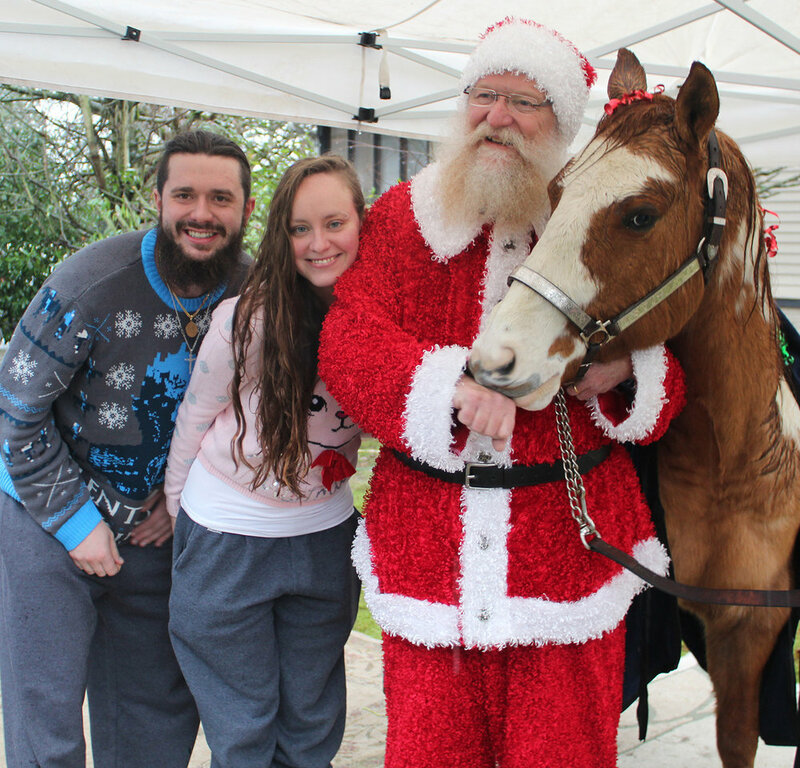 There is no charge for photos with Santa and Jingle horse. We can take photos to email to you, or you may take your own photos. Don’t forget to dress for the weather as Jingles will be outside for these special photos! We are also accepting donations for Beck’s Place in Monroe. We will be accepting donations until December 28th 2018. Stop by and spread some cheer! Image Credit: Holly Ramsey and Marnie A. 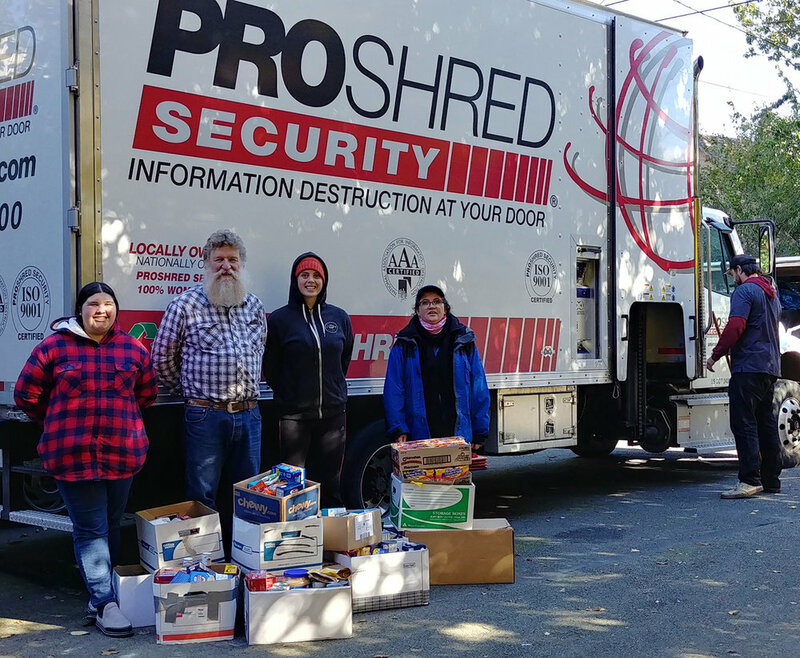 Successful Shredding and Food Drive! Shawn from Proshed was here with his mobile shredding truck from 9 am until Noon on October 13th 2018. We successfully shred 17 tips of the bucket. That is 1,632 gallons of paper or approximately 2 and a half tons of paper. We had two pairs of tickets that we gave to Event Participants for the 2018 Stocker Farms Family Adventure Farm and Corn Maze. Donations of Non-Perishable Food Really Stacked Up! We had a carload of 12 boxes of food donations and $142.00 in cash donations that were delivered to the Snohomish County Food Bank. FREE Document Shredding, Food Drive Tomorrow! Rick has 2 tickets to give away! For the 2018 Stocker Farms Family Adventure Farm and Corn Maze. Rick’s Wife, Dodi will pick a number between 1 and 10 and we will give the tickets to that lucky participant. The FREE Shred Event and Food Drive is tomorrow! Oct. 13th 2018 from 9 am-12 pm. Bring documents to be shredded by Proshed, a professional document destruction service with a mobile shredding unit. Donate non-perishable food to the Snohomish County Food Bank. Monday Morning Smiles is a new program Rick started with the help of Blue Ribbon Flowers in Everett. 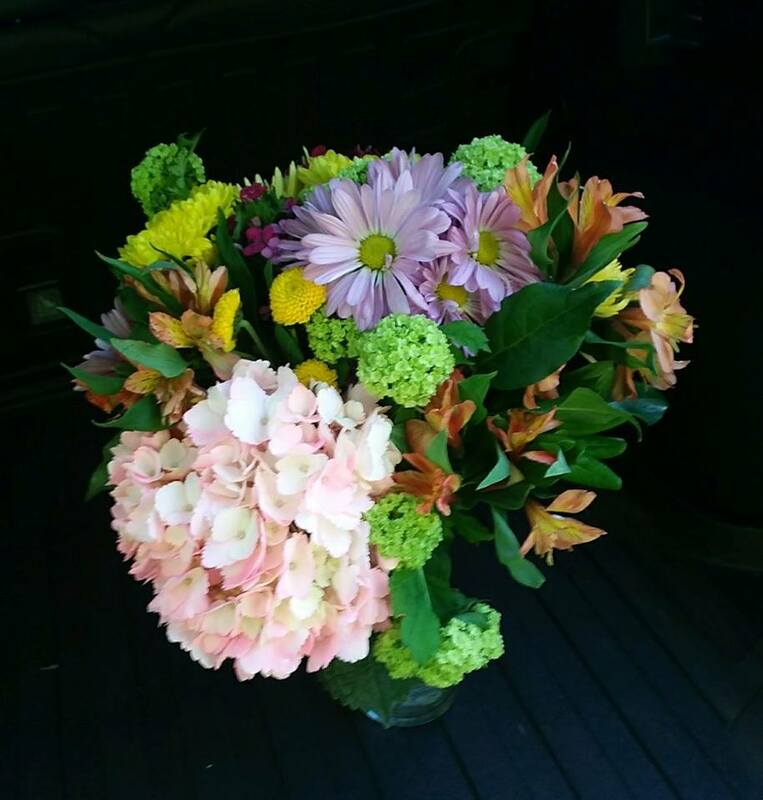 Rick delivers a bouquet of flowers to a Snohomish County business who is doing good in their community. This week led Rick to a coffee and bakery shop in Granite Falls called Hanky Pies. Hanky Pies opened in the fall of 2017 and strives to love their community well through various programs. One of their initiatives is a suspended food and drink wall where anyone is invited to take a sticky note off the wall and redeem it for a free coffee or sandwich at the counter. Krista, the owner, also partnered with The Fathers House church to create a program called a Cup of Cold Water which provide a free meal to anyone in the community on Thursday nights. Other programs include Good Deeds jars for kids, the 'Write a letter to...' station and the opening of their doors after business hours during a power outage last winter. Hanky Pie's Bank, KeyBank, recently held a contest for Small Business that gives back to the communities that they serve. Out of 2,500+ nominations in Washington State, Hanky Pies was chosen as the winner! Thank you Hanky Pies for setting such a great example for our community! Rick Merrill is teaming up with Everett native Blue Ribbon Flowers to surprise a Snohomish County business with a bouquet of flowers on Monday mornings! In his first week, Rick visited Keith Partington, Allstate Insurance Agent located on Broadway in Everett. He and Shylah do excellent work and are always available to answer any insurance questions for their customers. This last Monday, Rick delivered flowers to Dr. Jim Courrier of Courrier & Boggeri General Dentistry located on Colby Avenue. Dr. Courrier and his team are known for their excellence in dental care and how they treat their clients. for more Monday Morning Smiles and to see which businesses get a surprise visit from Rick! Be sure to stay connected with us on social media or sign up for our newsletter below! 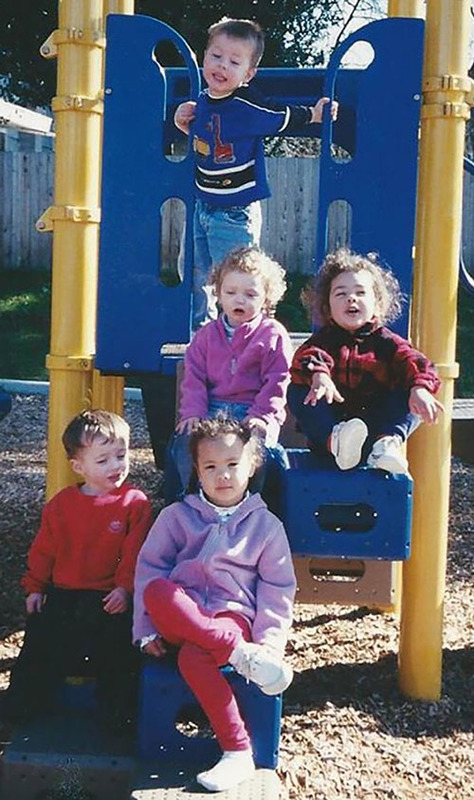 Who demonstrate their care and commitment to each generation of children. Winners are presented a plaque, a great big check to display, and $500 to help defray miscellaneous costs for the classroom. Diane Meyer of the Lakewood Middle School. The teacher I would like to nominate is Mrs. Diane Meyer, she teaches Algebra and Geometry, along with being a volleyball coach at Lakewood Middle School in Arlington for 19 years, she is wonderful, kind and supportive. She is always available for advice or help which encourages us to try harder to be successful. Her favorite song to play before a test is “Eye of the Tiger” being that math is important for many aspects in life, she teaches the daily lessons with a style that we are able to understand the formulas to solve the problems, and to achieve well on the tests with high scores. When I first entered her class I was nervous if I would be able to continue reaching my math competency, but thanks to Mrs. Meyer I have been successful on maintaining my academic grade of an A in this class. I would appreciate your consideration for Mrs. Meyer as a recipient of your teacher of the month. I know this would bring great joy to her to know her gift of teaching has inspiring us to always focus on success and to” rise to the challenge”. We are very pleased to announce that Jan Boula has selected the Children of the Nations to receive the $100 Donation. Mark Landry and the Women and Children's Shelter. Tony Rodarte and the Everett Animal Shelter. They enjoyed their visit to the Law Office of Rick Merrill on Saturday. Visiting with the children before the busy season was a real treat. They enjoyed the delightful conversations, reading stories, playing with toys, coloring, and taking pictures with the good boys and girls was lots of fun. They plan to come visit again and maybe bring a friend along, so remember to be good! We will be accepting donations of dog and cat food and supplies, hygiene items, household cleaning supplies, sleeping and outdoor supplies, or clothing. These donations are then shared with those in our local community who are struggling. You can connect with us on any of the Networks listed below. Santa will be stopping in at Rick Merrill’s Law Office. There is no charge to take pictures with Santa. You can bring your own Camera to take pictures if you would like. If you choose to have us take the pictures, We will email the digital copy to you so that you may have it printed at the location of your choice.